I am currently with Virgin cable at 4mb and pay line rental to TalkTalk. I rang sky to ask what speed I could expect if I joined skyMax but the guy refused to say until I started the sign up process! We have determined your line is capable of upto 4mb or 4000Kbps. * ADSL MAX (upto 8mb) is available. So do I take it that if i choose ADSL Max I will only get up to 4mb in which case theres not much point. 2) Do I need to stop paying my line rental with Talk Talk and go back to BT and then join up to Sky or can I continue to pay line rental only with Talk Talk ( if have no call plans - just the basic service) ? I am getting mixed messages when I look through these forums. If that is all the info that is on the exchange, it does not appear to be Sky enabled. ADSLMax is a BT product, sold by Sky as 'Connect'. If Sky intend enabling the exchange within the next 5-6 months, you may be offered Connect at £5, instead of £17. 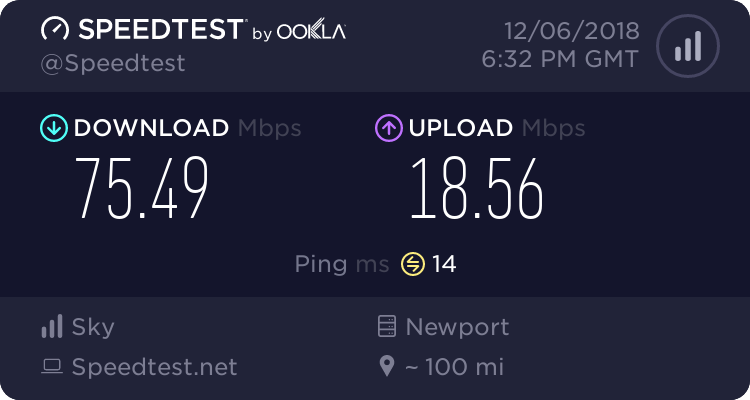 Unfortunately it is not possible to say what your speed would be until you are connected with the Sky router. If you can post the stats of your router, ie, SNR and Attenuation, someone may be able to give you an indication. Sorry, I thought I had made myself clear with my second post - the checker says I can get SKY MAX ie ADSL 2 which offers speeds up to 16Mb but the ADSL checker tool says I can only get 4mb ( not the 8mb max that this supports) so therefore would the ADSL2 package called SKYMax only give me 4mb (rather than the 16mb max supported). Without your line stats it is impossible to tell, but if you are a mile from the exchange and your line is reasonable, you would probably get 12-14 mb. If you obtain your line stats and put them into THIS checker it will give you a good idea. Could you point to where it says this please? I can find no reference to having to have your line rental with BT. All I can find is that it must be a BT compatible. Several members of the forum use Post Office Home Phone and pay rental to them, for example. You don't need to pay line rental to BT you can use any company you want and not just BT. All it says in T&Cs is that you need a BT compatable line.